You know the very best thing about farro? Farro’s extremely versatile. This chewy little grain which can be used in a myriad of delicious ways also tastes awesome as-is, right out of the cooking pot. Farro is hulled wheat. Wheat is either free-threshing, which means the outer sheath is soft and easy to remove, or hulled. Hulled wheat normally includes wild wheat and other ‘ancient grains’. 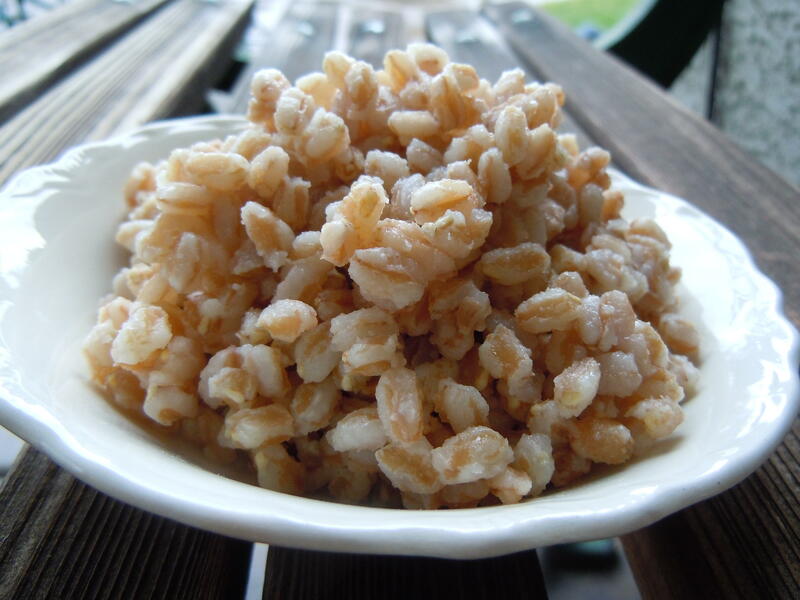 It’s similar to barley in both taste and texture (but I like farro better). It’s chewy and nutty. Or, if you cook it a little less, it will be lightly crunchy and nutty. I prefer softer, because then it’s as comforting as a new pair of flannel pajamas after a warm bath. Farro’s also high in protein, fiber and B complex vitamins and it’s pretty low in gluten—so those are some really healthy flannel pj’s. And many fans of old school hot cereal have unknowingly eaten bowls of farro in the form of ‘Cream of Farina’. But regular farro makes a pretty nifty hot cereal as well. You can make a big pot when you have time, then just nuke and dress it for breakfast. The grains actually have two cooking times and procedures to go along with them. For the crunchier version, put salted water in a heavy saucepan like you would for pasta; but at least 6/1 water to farro ratio. Bring the water to a boil, add farro, lower the temp to medium and cook, uncovered for around thirty minutes. Drain and serve. A serving size is ¼ cup uncooked. But I just really enjoy the mouth feel that slower cooking gets you. The other night I made a new farro recipe to go along with some parmesan crusted chicken cutlets. I did all the prep work well in advance so, when we were about an hour and a half out from dinner, all I had to do was apply heat. Roast garlic: Set oven to 350. Place peeled cloves on a piece of foil. Sprinkle with salt and pepper, and drizzle with 1 teaspoon olive oil. Close foil, making airtight package. Bake for 45 minutes, then remove from oven and let cool. To use, place roasted garlic on a dish and mash it, pouring any remaining oil on top. Put all the ingredients except the Parmesan and the spinach into a heavy saucepan with a lid. Bring to a boil, then reduce heat to medium-low, cover, and let cook for 45-55 minutes, or until the farro is tender and all the water has cooked in. At this point, add the spinach on top and without stirring, re-cover and let sit off heat for 10-15 minutes. To serve, stir in spinach, and spoon onto plate, adding Parmesan to taste. Serves 3. I know that earlier I said farro’s like flannel pajamas. But maybe it’s more like a little black dress. You can dress this grain up or down, and serve it up plain or with lots of additions. But maybe it’s more like a pair of bowling shoes, or a well-worn jean jacket, or a lacy bra, or… Thanks for your time.